You’re curious now, right? Haunted Mansion: Clue is the only other Haunted Mansion themed game, but they have Theme Park versions of Monopoly, UNO, Sorry, Twister, and Candy Land. They also have original board games, such as Pirates of the Caribbean (I and III). 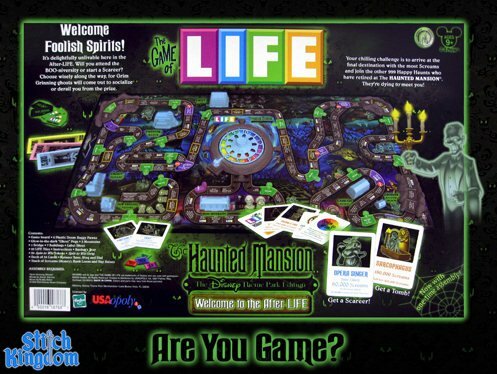 We love the game of Life Haunted Mansion. We have lost the rules and there is alot to know for this version of life. Does anyone know how to get another copy, Disney was no help. It’s not in Hasbro’s online database of game rules.